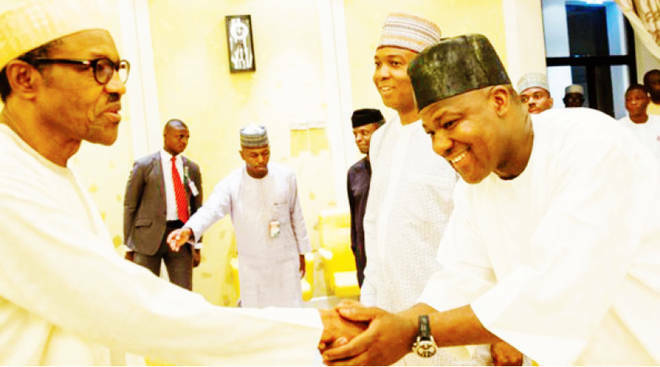 Some legislators are deep-neck in a process to override President Muhammadu Buhari’s decision to reject an amendment to the Electoral Act, and leaders of both chambers of the National Assembly are not amused at each other’s position. There is a simmering disagreement between the Senate President, Bukola Saraki and the Speaker, House of Representatives, Yakubu Dogara, over a plot by legislators to override President Muhammadu Buhari on the amendment to the 2010 Electoral Act, Daily Trust has gathered. National Assembly from further action on the amendment. Already, the House of Representatives has agreed with the president on two of his three reasons for withholding assent to the Electoral Act Amendment Bill. The president in his letter to the National Assembly cited three constitutional matters for withholding assent to the bill. House spokesman, Abdulrazak Namdas, told journalists in Abuja on Wednesday that they would re-introduce the bill and pass it for second and third readings before re-transmitting it to the president. Though Daily Trust could not get the immediate position of the Senate on the House of Representatives resolution as the spokesman, Aliyu Sabi Abdullahi (APC, Niger) was unavailable for comment and did not reply a text message sent to him on the matter, it was however gathered that with the development in the House, the senate has no option than to follow the decision to revisit the bill. “We will allow them (House) to conclude work on it and they will send it to us for concurrence,” a reliable senate source said. Another lawmaker said left for the senate leadership, both chambers would proceed straight to override the president without considering the reasons he gave. “But we felt that the president was right in some aspects, that’s why this thing about revisiting the bill came up. As it is, proponents of the bill in the senate are not happy,” he said. Asked if Speaker Yakubu Dogara is personally in support of the bill, he said: “One can say yes and no, regarding his support for the bill. From his body language, he wants to allow members to have their own say. “You know there’s this notion that he’s romancing with the presidency too much and that he’s the only one benefiting. So, he wants to use this opportunity to show that it’s not true. Daily Trust further gathered from members of the House of Representatives that it may be difficult to get the required number to override the president if he rejects the bill again. “Let’s tell ourselves the truth, whether you like it or not, Buhari is still popular in the North. Anything that has to do with him, one should be very careful not to get into trouble. You can’t just wake up one day and say you want to challenge him and succeed,” a lawmaker said on condition of anonymity. A Federal High Court presided over by Justice Ahmed Mohammed on Wednesday restrained the National Assembly from acting further on the Electoral Act (Amendment) Bill 2018. Mohammed in his ruling on an interlocutory injunction by the Accord Party ordered all the parties to maintain the status quo until Tuesday when the case will be heard in court. The senate resolved to notify and write a letter to the CJN to inform him of the latest situation and remind him of the principle of separation of powers as enshrined in the Nigerian constitution so that he would caution judicial officers to avoid this kind of situation in the future. Before the Wednesday’s resolution of the House to revisit the bill rather than overriding the president, the two groups at the senate had commenced collation of signatures. Three senators who spoke to Daily Trust separately confirmed the collation. While Senator Dino Melaye (APC, Kogi) was said to be collating for the camp against the president’s action, the pro- Buhari camp is being led by Senator Abdullahi Adamu. Daily Trust gathered that while those in the anti-Buhari camp are claiming to have got 65 senators, those supporting the president’s action have 43. While two third of the senate is 73, that of the House is 240. Since 1999, the National Assembly only used this power once. That was during the establishment of the Niger Delta Development Commission (NDDC). A Northeast senator who confirmed writing his name on the list of the pro-Buhari camp said those against the president’s action are the majority. A senator in Melaye’s camp said they had gone very far in their quest to override the president’s action. “It’s a mission accomplished because we have gone far on the project. Forget about their claim, they are very few and you know it is a game of numbers, not a game of propaganda. We have gotten more persons from their camp. We are just waiting for the day,” he said. Also, a pro-Buhari senator said they would make the voting pattern of the override public. “You know we are here representing our constituents but it is very unfortunate that many of our colleagues have abandoned those who sent them here for Saraki. “Since voting would be done electronically, the result would be part of our votes and proceedings of the following day, we will make it available to the public,” he said on condition of anonymity. On Thursday, the Senate leader, Ahmad Lawan, openly threw his weight behind the president’s action on the matter even though he faulted the court ruling on it. A ranking senator said they had sought the intervention of the leadership of the All Progressives Congress (APC) on the matter. He said the National Chairman of the party, Chief John Odigie-Oyegun, is expected to meet with the caucuses of the APC at both chambers of the National Assembly to plead with the lawmakers to toe the party line, the president’s action. The northern senator who pleaded anonymity said they had since realised that the reordered election timetable was a game plan of the People’s Democratic Party (PDP). “We have spoken with our party to come into the matter because we have since realised that it is the agenda of our colleagues in the PDP. We will not fall into their plot to ridicule our party in 2019. “Yes, our aggrieved colleagues in the APC who have almost perfected their plans to decamp to the PDP or SDP are in support of the game plan, we believe that the quick intervention of our party will make an impact,” he said. Lawmakers who are of the APC told Daily Trust that the president’s understanding of the principle of separation of powers was strange and that he abandons his supporters at will. A senator said the attitude of the president towards his supporters in the parliament was responsible for the field day the opposition presently has in the parliament. “Senators are being careful to openly defend the president. Look at what happened to Ndume when he supported Buhari at the peak of the Magu saga, or is it Omo-Agege’s case you want to talk about. If not for this, a lot of us would have come out openly to fight for him (President),” he said. A member added: “Left for me, we can override the president at any time. The truth of the matter is that when you stand by the president, he abandons you when you’re in trouble. “There’s this belief that most of us won elections because of the president’s popularity. Now we’re saying let everybody answer his name, but they’re objecting. I don’t know the kind of logic that is. But a PDP member said they were determined to ensure passage of the amended Electoral Act no matter what it takes. “There’s no going back. It’s not about party but about the independence of the legislature. We want to assert our independence so that anybody that comes to the National Assembly, it won’t be based on anybody’s popularity. “We’re seriously determined to override the president should he reject the bill the second time. We’re mobilizing in both chambers. All the noise about governors trying to force their members not to support the bill won’t work. “Do the governors like Buhari? They’re doing that for their own selfish reasons. If they promise members return tickets, I can assure you that they won’t fulfill that at the end of the day. “So, let the time come. You’ll see what will happen. We’ll get the required number (240) to override the president, there’s no doubt about that. Our leaders are determined and nothing will stop us. This is something that will deepen democracy, but we’re surprised that they don’t want it,” the PDP member said. Another lawmaker who did not want to be named also said Saraki and other key APC senators were seriously pushing for the amendment to be passed into law for them to carry out anti-party activities after winning their elections. “As for Saraki, the truth is that he doesn’t know what his fate is come 2019. He believes that he should use all the available opportunities now to get at the presidency. The whole idea is to force the presidency to come to the negotiating table with him so that he’ll know his direction. The Chairman of the Independent National Electoral Commission (INEC), Professor Mahmood Yakubu, says the electoral body would not discuss the implications of the president’s decision to reject the bill since the process has not been concluded. INEC’s Chief Press Secretary (CPS), Mr. Rotimi Oyekanmi, quoted the chairman as saying that the current dates for the 2019 general elections were fixed in line with provisions of the existing law. On the implications of the president’s decision, Oyekanmi said, “It is within the powers of the National Assembly to make laws. The 1999 constitution has also clearly stated the process through which a bill enacted by the National Assembly can metamorphose into a valid law. Part of the process is the prerogative of the president to either give or withhold assent. While it is true that INEC made recommendations to the National Assembly during the electoral law amendment process, it is not in our place to begin to discuss the implications of a process that is yet to be concluded. As for the re-ordering of the election sequence, INEC fixed the dates for the 2019 general elections in exercise of the powers conferred on it by Section 30 (1) of the Electoral Act 2010 (as amended). Remember that the tenure of the President, Vice President, Governors and Deputy Governors of the states (except Kogi, Bayelsa, Edo, Osun, Ekiti, Ondo and Anambra States) will expire on May 28, 2019, while membership of the National and State Assemblies will stand dissolved on June 8, 2019. The Deputy National Publicity Secretary of the Social Democratic Party (SDP), Alhaji Alfa Muhammed, said the decision of the pesident had raised suspicion that he was working with the electoral body. Muhammed, in an interview with Daily Trust, said the action would create an atmosphere of delay and uncertainty within the polity. He said, “The rejection by President Buhari raises suspicion of collaboration between the APC government and INEC. This position is affirmed by Mr. President’s decision to side with the INEC against the National Assembly in the quest by the two institutions to assert their constitutional powers. Ordinarily, the president should have sought judicial advice on who has the final authority on the matter if he was in doubt. The National Chairman of the Action Democratic Party (ADP), Engineer Yabagi Sani, said the timetable face-off between the National Assembly and the Presidency was a danger sign post for 2019. In an interview with Daily Trust, Sani also said the confrontation between the National Assembly and the Presidency on the issue might spell doom for the general elections unless the National Assembly, which is the guardian of democracy and the promoter of the interest of Nigerians, overrides the president’s veto. He said the president’s decision was an indication that selfishness and impunity had not only come to play but that some people had made up their minds to win elections at all costs without considering the people’s wish. Sani added, “You would recall that we held a news conference to challenge INEC that the released schedule was undemocratic and unacceptable. Yet, sadly, INEC came up insisting that it would not shift ground.